Break Thru Radio did a feature show on the New Orleans Indie Rock scene featuring some of our favorite artists. Check it out Here. For You Girl-The Bally Who? So Antenna Inn played our wonderful Krewe De Vieux after party back in February. What was created from it, was a wonderful movie broken down into 4 parts here. 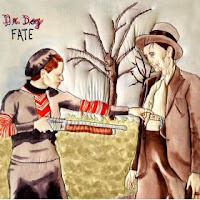 Today and today ONLY... Dr. Dog's album FATE is on Amazon.com's "Deal of the Day". That means that it's on sale for the ridiculously low price of $1.99. That's 11 songs at about 19 cents per track. Get it while it's HOT. Ow! Get it HERE. 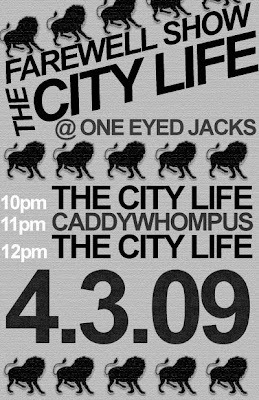 The flyer says it all. The City Life will be missed. To many The Strokes are a past hot spot in the world of Rock n Roll. But to those who appreciate the impact they had on the music in the early 00's, a new release has long been anticipated. Apparently, work has started with 3 songs written and much greater group oriented work ethic. Check out more here. Personally, this is one of my favorite bands of all times.